The next part of the Business Proposal to write is the Deliverables section. 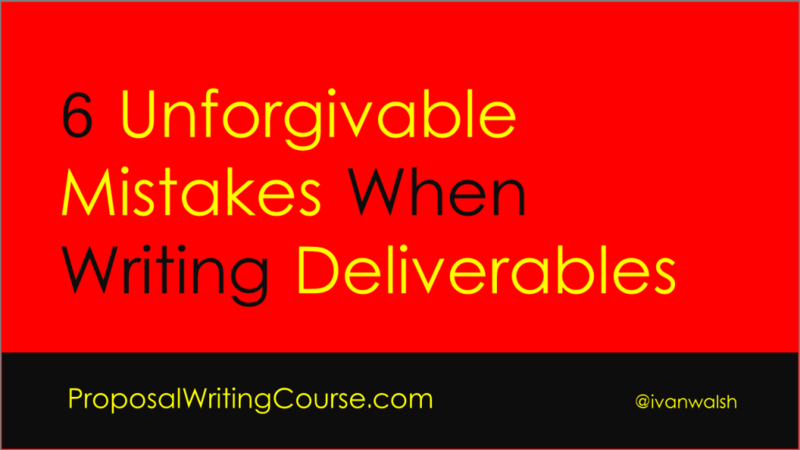 The Deliverables section should be simple to understand but many Proposal Writers fall over themselves here. Let’s play good cop, bad cop for a minute. conclusions, supporting charts, analysis and recommendations). Examples of how this will be done. If you don’t give some examples, then it’s hard for them if you can genuinely do this or… are simply saying Yes to get your foot in the door. One of the difficulties in writing the deliverables section is that you’re trusting the project manager to ‘deliver’ these requirements. In some situations, this section is given to the PM to write. This makes sense up to a point. However, you need to be careful that the PM, in his/he eagerness to please the team lead will commit the following mistakes. An inexperienced project managers may become enamored with his work breakdown structures. Instead of keeping things simple, they may design the WBS so it becomes almost impossible to manage. For example, we worked on a project in Shanghai where the PM created 275 work packages; some were broken down into minutes rather than hours or days. As above, if the PM is new to this area, consider getting another PM to check their figures. Many young PM will pretend they have worked in an area to avoid been exposed as inexperienced. All projects have risks. An inexperienced project managers may not see potential risks in the project. If the necessary contingencies are not put in place (or at least acknowledged) then your project costs could escalate if an unexpected event arises. Most project managers want to please the customer. But, there are limits. Make sure the PM is not bullied into agreeing to new deliverables without consulting other team leads. Likewise, make sure that scope creep is addressed upfront so the client does not try to squeeze in new features without paying the full price. It is critical that, as part of stakeholder management, project managers interview the stakeholders to learn what information they deem as important and then act accordingly. They also need to understand the tracking metrics or key performance indicators (KPI) so they can design an different performance dashboard for each stakeholder. Novice project managers, with little hands-on experience, may jump to conclusions or interpret requirements based on a limited understanding of how these will impact the project schedule. You need to monitor these project manager and ensure that they consult with subject matter experts to get the correct figures. Include descriptions of the types of reports that will be used in the project. Show Status Reports and detailed information on risk, vulnerabilities, and the necessary countermeasures and recommended corrective actions. Include sample reports as attachments to the proposal to demonstrate that you’ve supplied these types of reports to other clients. Then, break out the key deliverables and work through each one individually. In other words, instead of agreeing to provide these deliverables, paint a picture in the reviewer’s mind so they can see how you will do this. The key is to see every page on the proposal as an opportunity to build more trust with the reviewers. Use each section to demonstrate your competence and how your understanding is greater than the other bidders. Remember, to add the deliverables to the project plan with an estimated delivery date. More accurate delivery dates will be established during the scheduling phase, which is later in the proposal. Next up, we’ll look at how to schedule meetings. About the Author: Ivan Walsh is a Proposal Writer who develops Business Proposal Plans. He also shares Business Planning Strategies on IvanWalsh.com. Follow him on Twitter & Facebook. Are your Business Consultants worth the money? Can She Lead? Are Women Better Managers Than Men?